Limited edition and individually numbered sets. Are you a fan of KISS? Then this limited edition tin tote gift set is for you! Includes tin tote, flask, and set of 4 shot glasses. Entertainment Earth Convention Exclusive! Are you a fan of KISS? Bif Bang Pow! sure is and we think you are too. 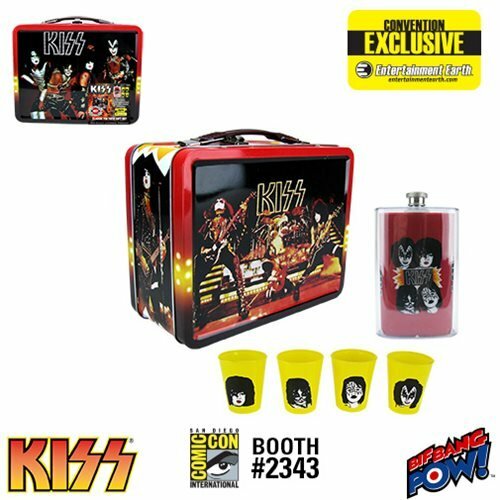 That’s why we created this totally awesome KISS Classic Tin Tote Gift Set - Convention Exclusive. The KISS Classic Tin Tote Gift Set - Convention Exclusive is a limited edition of only 2,960 sets that come individually numbered. This tin tote gift set is based on the classic tin tote from 1977. The tin tote measures 8 5/8-inches wide x 6 3/4-inches tall x 4-inches deep. Inside you’ll find a flask with plastic exterior and a stainless steel interior that holds 5 ounces of your favorite beverage. It features artwork of the band against a red background on the front and awesome orange and yellow flames on the back. The set also includes a set of four yellow 2 oz. shot glasses. Each shot glass features the image of a different character from the band along with the KISS logo on the back. Drink to one of the world's greatest bands today! Ages 14 and up. Flask and shot glasses are hand wash only. Not dishwasher safe. Do not microwave. Thoroughly hand wash before first use. KISS is a hard rock band founded in New York in the early 1970s. Known for their outrageous makeup and costumes, each member of the band adopted their own unique comic book style persona. The KISS lineup features The Demon on bass guitar and vocals, The Starchild on rhythm guitar and vocals, The Catman on drums and The Spaceman on lead guitar. However, their look isn’t the only thing they’re known for. Since their formation, KISS has put on very extravagant live performances that include fire breathing, blood spitting, levitating drum kits, rockets and other crowd-pleasing pyrotechnics.